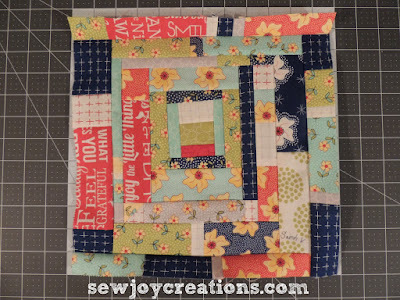 This year several of the quilters I chat with regularly from Pat Sloan's old forum decided to exchange quilt blocks. We decided on doing a birthday block exchange so that each quilter could pick what block she wanted - down to size, theme, fabrics, pattern - and receive them in the month of her birthday. February is the first month we had birthdays and Caryl is first. Here's a recent post of Caryl's that is a virtual quilt show - enjoy some of her great quilts! Caryl also did the Disappearing 4 patch tutorial that I used to make this stocking. You can find the links for all over at my Tutorials page. This is the block I made for Caryl. She wanted log cabin, any size, any style and the *logs* didn't have to be the same size. I used the leftovers of Pat Sloan fabrics that I had on hand - will have to restock for the rest of the blocks! - and loosely followed a block I pinned that Caryl said she liked. Since I am one of the organizers of the exchange, I decided to make a pinterest board of blocks that fit the themes suggested by quilters in the group. It's a work in progress! Many asked for *quilter's choice* so I thought I could help narrow down - or offer up - some choices. My birthday is coming up next week! I'll share a post with the blocks that I made for me and the ones I received. I forgot what a *JOY* it is to receive *squishy* mail! Great use for the disappearing nine-patch! I never was a fan of pink, but now I have a new appreciation for it since having my daughter three years ago. I recently got some pink feed sack bags, so I'm designing something with them.